Heats, repechage and final were used for all events at this year's Men's Interstate Championships over two days. SA were the early leaders followed by NSW and VIC. By the half way mark NSW narrowly took the lead from SA. The fast finishing Victorians caught the New South Welshmen close to the line to win by 1/2 canvas with SA a half a length further back. The Tasmanian sculler led early and maintained that lead until 100 metres to go when passed by the very fast finishing Jeff Sykes who won by 3/4 length. The early leaders were TAS but by the 800 metre mark, VIC gained the lead and was never headed thereafter. NSW did most of the chasing but were passed in the last part of the race by SA. 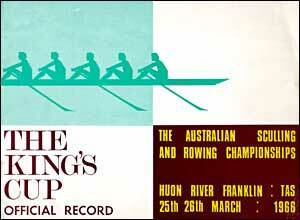 Alan May in Sydney Rows states that the Sydney Rowing Club crew was inexperienced and unsettled by the big occasion. The New Zealand crew were rowing by invitation and so Victoria took the title. The New Zealand crew were dominant throughout the race and won comfortably.